Adult pandas weigh 165-353 pounds. Their body length is 4-5 feet, with a 5 inch tail. Males are slightly larger than females. They have stronger forelegs, wider muzzles and are 10-20% heavier. Pandas have stout, powerful limbs. Their hind feet lack a heel pad. Pandas have scent glands positioned under the tail. Their head is relatively massive with well developed chewing muscles. Unlike other bears, they have well-developed premolars. Their molars are broad and flat and adapted to chewing bamboo. 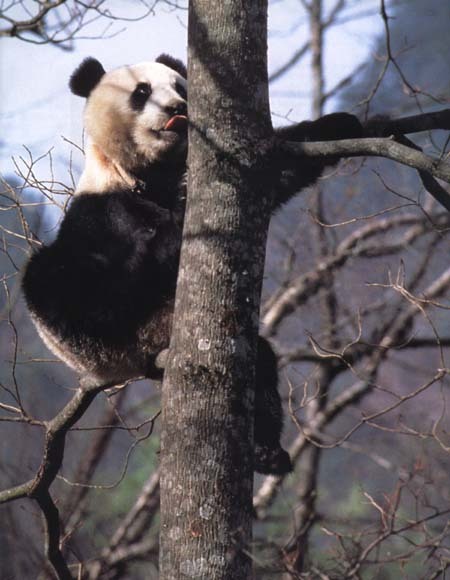 Their digestive system is typical of a carnivore; only slightly adapted for processing bamboo: tough esophageal lining, pyloric region of stomach thick and muscular, small intestine shortened, colon surface area enlarged. Male genitalia is similar to red panda. Vision is poor. Their pupils have a vertical slit like many nocturnal animals. Sense of smell is very good. A panda's coat is thick and wooly. It is white with black eye patches, ears, legs, band across shoulders and sometimes tip of tail. Fur is slightly oily preventing water penetration. Their striking coloration is thought to be an important signal to other pandas ( They avoid contact and have poor vision). Brown-and-white pandas exist but are extremely rare. Black and white and bear­like, the panda roams in a well­defined home­range of between 3.9 and 12 km. Much research on pandas has been conducted at the Wolong Nature Reserve in Sichuan. Studies here showed that the panda lived a solitary existence, meeting only occasionally with other pandas, except during the very brief mating season in late spring or early summer when several males come together and compete for a female. A female is on heat for two to three days. New research from Shaanxi Province's Qinling Mountains now presents a different scenario. Far from living alone, it claims, pandas in Qinling live and travel in groups of at least two, and sometimes in groups of up to 28.